A casual oceanfront island style cottage with amazing views! From the lanai of this waterfront cottage see breaching humpback whales (when in season) and spinner dolphins frolic by day. Enjoy spectacular sunsets at twilight and then watch the universe unfold into a star drenched velvet sky by night. And if you’re still awake, catch shooting stars or an orange marmalade moon sinking into the sea. 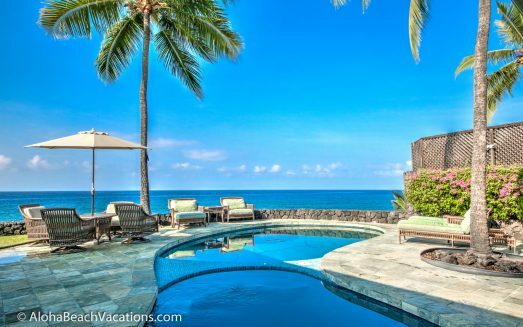 Sip your favorite beverage and relax from the daily grind of snorkeling, fishing and sunning on the beautiful Gold Coast of Kona, Hawaii. Your sweet romantic island cottage comforts you as island trades rustle the palms and gentle surf lulls you to sleep. French doors open onto the deck above the water’s edge. With the home’s vintage tropical island motif in cool shades of greens, kick off your shoes and pad around the smooth parquet floor as you prepare breakfast and enjoy the dining nook awash with gentle light. Open beam ceilings, a furo (Japanese soaking tub), 2 bathrooms, new appliances, washer and dryer, ample parking and a king size bed and queen sofa sleeper complete the package. If there are more than four in your party, there is a studio with its own kitchenette plus bath available to accommodate two with a double bed, small refrigerator, small flat screen TV and oceanfront views! The French doors allow you to make the ocean part of the living room and provide the ultimate Big Island outdoor living experience, with cool tropical breezes coming in from the ocean. The home has a two car garage. The cottage is close to Kahalu’u Beach State Park, famous for spectacular snorkeling and encounters with the graceful green Hawaiian Sea Turtles. Up the coast is a busy marina with Hawaii’s best scuba diving, big-game fishing, kayaking, dolphin and whale watching and other ocean activities. Conveniently located, a great home base to explore the many wonders of the Big Island including Volcano National Park, Mauna Kea Observatory, coffee and macadamia nut farms, artist communities, and more!